Mitochondria are literally your cell’s energy powerhouse. This is where ATP is produced. On a cellular level, the more your cells contain, the larger they are, the more capacity your body has to train, compete, and remain healthy & robust. OFM provides a “Mitochondrial Advantage” in numerous ways. Simply put, a molecule of fatty acid via beta-oxidation produces approximately 4 times the net ATP over a molecule of glucose (129 vs. 36). The pathway for beta-oxidation is much more efficient than that of glycolysis, resulting in significantly less oxidative stress on the mitochondria and stress. In the real world, this means less muscle soreness and quick recovery. 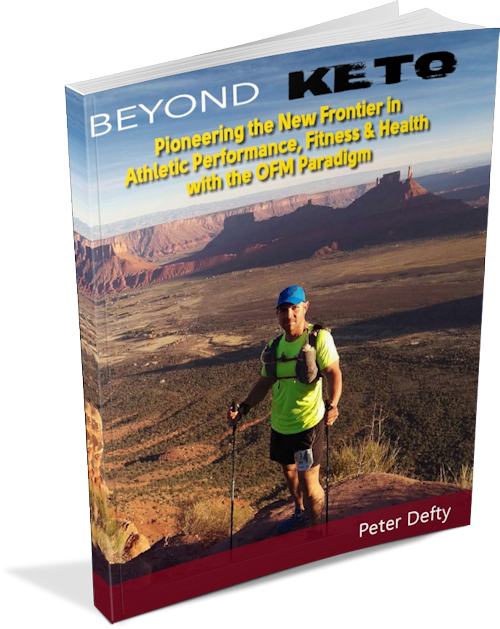 There is a body of research literature emerging on how becoming “fat-adapted” or “keto-adapted” has tremendous positive health benefits on a cellular and even DNA level to slow degradation and aging. Burning fat via beta-oxidation and ketone bodies has profound beneficial effects on mitochondrial function and health versus glycolytic pathways. (https://www.cell.com/trends/endocrinology-metabolism/pdf/S1043-2760(13)00156-2.pdf). By comparison, a conventional high carbohydrate diet (>50% CHO macronutrient profile) causes a great deal of oxidative stress and lactate load for the mitochondria. Because the OFM diet focuses on delivering nutrition via nutrient dense whole foods including the “Whole Animal” concept, the athlete provides the cells with an optimal supply of the building blocks for increasing both the sheer number and size of intra-cellular mitochondria including the hormonal balance necessary for optimal mitochondrial health and synthesis. A diet high in carbohydrates and relatively low in fat, typical of the conventional “healthy” athletic diet, does the exact opposite. Most carbohydrate-dense sources an athlete needs to use to fuel themselves with glucose are relatively devoid of nutritional levels. Not only are they low in nutrition, but often relatively low in bio-availability along with improper nutritional balance, which creates a lot of work in food combining. A healthy stomach, gut epithelium, and robust biome are key to absorption of the nutrition from your food. Additionally, the biome synthesizes many key fatty acids and even some hormones necessary for mitochondria health . Read this, this and this to learn more. Read this to learn how to implement. Training and competition provide the adaptive stress athletes need to trigger the hormesis necessary to spur increases in mitochondrial count and size. The more specific term is “mitohormesis“. The current body of literature suggests successful aerobic training can result in up to 100% increase in mitochondria mass within the cells. This science is based upon studies conventional carbohydrate centric world. Our speculation, based upon published literature and observational evidence, is OFM increases mitochondria significantly more than what the current literature suggests through fat-powered aerobic activity. Hydration become more critical when fat-adapted due to the increased intra-cellular energy development. Proper hydration allows mitochondria to stay cool, while yielding the high energy output of burning fat as fuel. VESPA drives high level fat metabolism. The “recovery” everyone notices when using VESPA really means you have not done as much damage in the first place. Lower oxidative stress and lactate load imply better mitochondrial health. Limited, but “strategic,” use of carbohydrates means the athlete gets the fast burning fuel the body needs for aerobic threshold & anaerobic level and in a quantity which will provide hormesis to build more and larger mitochondria to handle the load. This minimizes the oxidative stress and lactate load imposed upon the mitochondria, cells, and body.